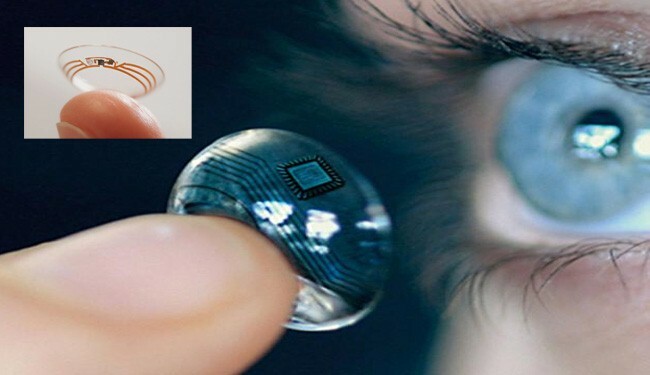 JNN 19 Jan 2014 New York : Google has unveiled a contact lens that monitors glucose levels in tears, a potential reprieve for millions of diabetics who have to jab their fingers to draw their own blood as many as 10 times a day. According to Google’s Brian Otis and Babak Parviz — the project’s co-founders — the tech giant is devising a way for diabetics to check their glucose levels by wearing a contact lens, which detects high and low blood sugar readings via tears. Otis and Parviz said that the lens contains a tiny wireless chip and a mini glucose sensor, which sit between two layers of soft contact lens material. Here’s some great news for those who can’t find enough time in the day to prick their fingers and check: the new contact lens prototypes generate readings once per second. In addition to readings, the lens could also warn its wearer of extremely high or low blood sugar levels with tiny LED lights that glow when thresholds have been crossed into the danger zone. If levels fall too low, diabetics experience symptoms like shaking, sweating, blurred vision, confusion, and can even pass out. Uncontrolled blood sugar can result in damage to the eyes, kidneys and heart, meaning that diabetics must check their glucose levels often to make sure they’re right in the comfortable middle of high and low. Google is talking with the U.S. Food and Drug Administration (FDA) about it, and is also looking to partner up with companies that can bring it to market. In other non-needle related news, the TED Blog recently posted seven ways scientists are moving beyond needles, including inhalable insulin. Such devices like insulin inhalers and a glucose monitoring contact lens seem like moon shots, but they’re great starts — and great hopes for diabetics tired of the daily (and painful) grind. The prototype, which Google says will take at least five years to reach consumers, is one of several medical devices being designed by companies to make glucose monitoring for diabetic patients more convenient and less invasive than the traditional finger pricks. The lenses use a minuscule glucose sensor and a wireless transmitter to help those among the world’s 382 million diabetics who need insulin keep a close watch on their blood sugar and adjust their dose. The contact lenses were developed during the past 18 months in the clandestine Google X lab that also came up with a driverless car, Google’s Web-surfing eyeglasses and Project Loon, a network of large balloons designed to beam the Internet to unwired places. This entry was posted in Articles, United States and tagged Contact lens, Gluco meter, Glucose Meter, Google, Insulin Level, X Lab. Bookmark the permalink. REAL BREAKTHROUGH WILL COME ONLY WHEN A TOUCHING DEVISE WILL MEASURE THE GLUCOSE LEVEL AND AN EFFECTIVE PILL IS FOUND . THE EFFORTS ARE ON .